I was determined to make something truly Gothic looking and different from my recent pieces. Hopefully I have succeeded! I started by Aging a strip of sterling silver and then I twisted the wire and hammered to give a lovely old feel. 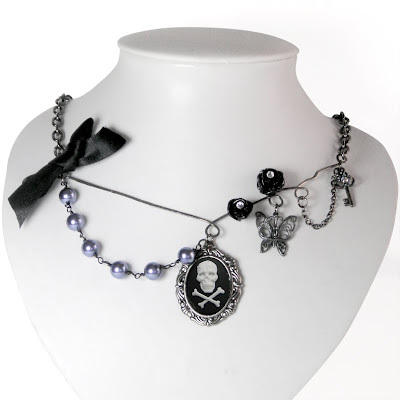 Next I added this fantastic skull and cross bones charm, oxidised sterling silver butterfly, black roses and vintage key. Of course I also added my signature touch of black satin ribbon. You can find out how to purchase this and other pieces by clicking here! Oh and don't forget to check out my blog tomorrow for a fantastic competition where you can win a Alice In Wonderland Pendant! I LOVE this,great job capturing the spirit! Very nice Janine, Its nice to see something completely different from your other jewellery. I like the choice of colour mixed with the aged looking chain.